Four kids in three different schools, seven teams with 153 practices, two dogs (really, what were we thinking? ), one busy husband, five million things to think about and ZERO sunshine. That's what is going on right now. You might call it treading water or just trying to stay afloat. Whatever you call it, it feels like a lot right now--stupid January. If there was more sunshine I truly believe that treading water would be a little easier. I mean right? Even if it was still 18 degrees, the sun would make me feel a little lighter, a little happier. It's just so grey and so dark. Waaaaa. For now, I'm doing what I gotta do to get through stupid January. I am popping Vitamin D supplements like candy, driving kids to all the practices and games, playing with the dogs and trying to keep everything straight. Of course things slip through the cracks. I mean even when it's sunny and 70, I am that mom that lets things slip through the cracks. BUT nobody has been kicked off of the team and nobody is going to school without a lunch, and that equals success in stupid January. Early yesterday morning, I realized I had no sandwich bags and no money on the kids' lunch accounts. Instead of freaking out I did what I had to do. I got a trash bag. I cut the trash bags into smaller squares. I put food items on top of the plastic trash bag squares. 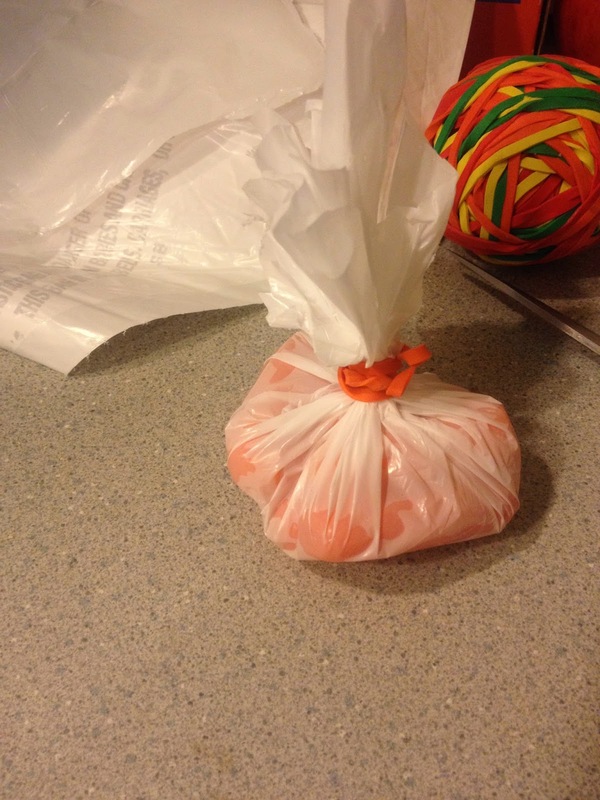 I wrapped the plastic around food items and tied the plastic together with a rubber band. Boosh! When I proudly showed my kids their plastic trash bag food storage bags, they didn't seem very excited. But guess what, nothing is exciting in stupid January. I didn't take it personally. It's stupid January, it's a busy life, we are treading icy cold waters, we are all doing what we gotta do. This post was in place of my usual weekly Pinterest Poser Challenge. I hope that once stupid January is over I will be making inspiring Pinterest crafts and recipes again. So as soon as February comes, be ready to be inspired, maybe. I'm sorry January is so stupid. But your trashbag lunchbag idea is GENIUS! Dude. I think you are probably the most resourceful, interesting, fun, fantastic mom I know. GO YOU! I have done the same thing with plastic wrap. All last week and most of this week I was kicking myself for forgetting to put money in the girls' lunch accounts. I did it late Wednesday night, so Thursday morning I was singing "You're buyyyyying your lunnnnnch todayyyyyyyy!!!!" It's the little things.